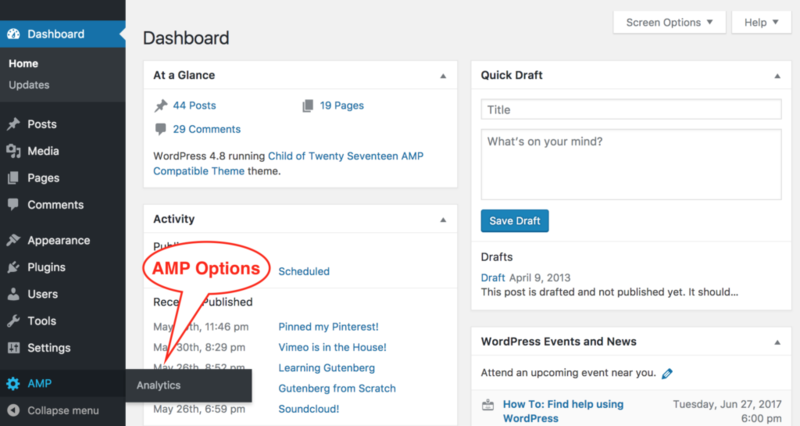 There are two options you can follow to include analytics tags in your posts. 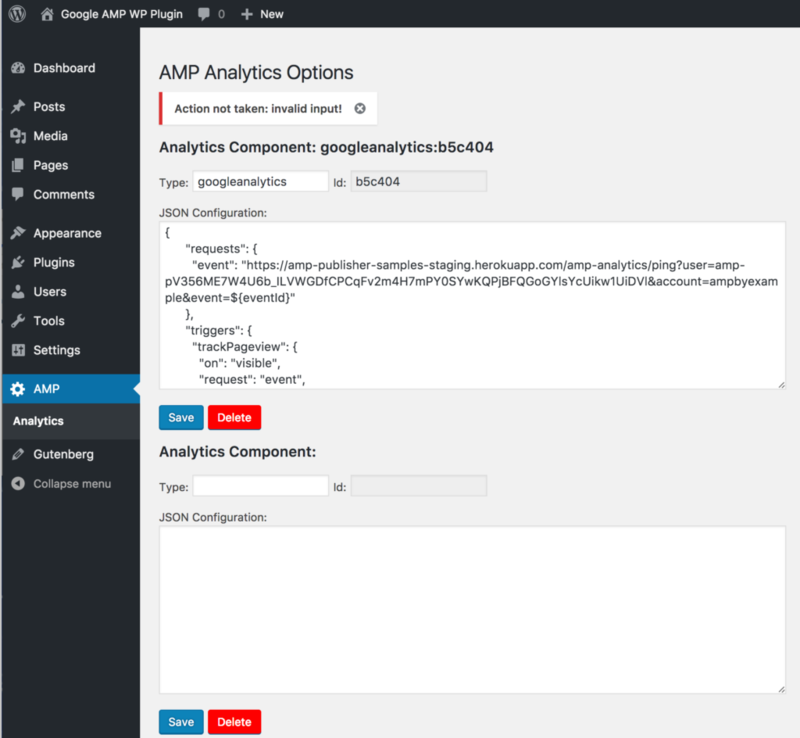 👉 For information on the JSON configuration supplied for Google Analytics, see Adding Analytics to your AMP pages. Selecting the Analytics sub-menu in the AMP options menu takes us to an Analytics Options entry page, where we can define the analytics tags we want to have, by specifying the vendor type (e.g. Parsely), and the associated JSON configuration. Notice that the goal of this option of the plugin is to provide a simple mechanism to insert analytics tags; it provides very simple validation based solely on the validity of the JSON string provided. It is the users responsibility to make sure that the values in the configuration string and the vendor type used are coherent with the analytics requirements of their site . Please review the documentation in the AMP project and in AMPByExample. And, if the configuration provided is actually a valid JSON string, a success message (in green) is displayed at the top of the window below the title, and again the entry form is reloaded. 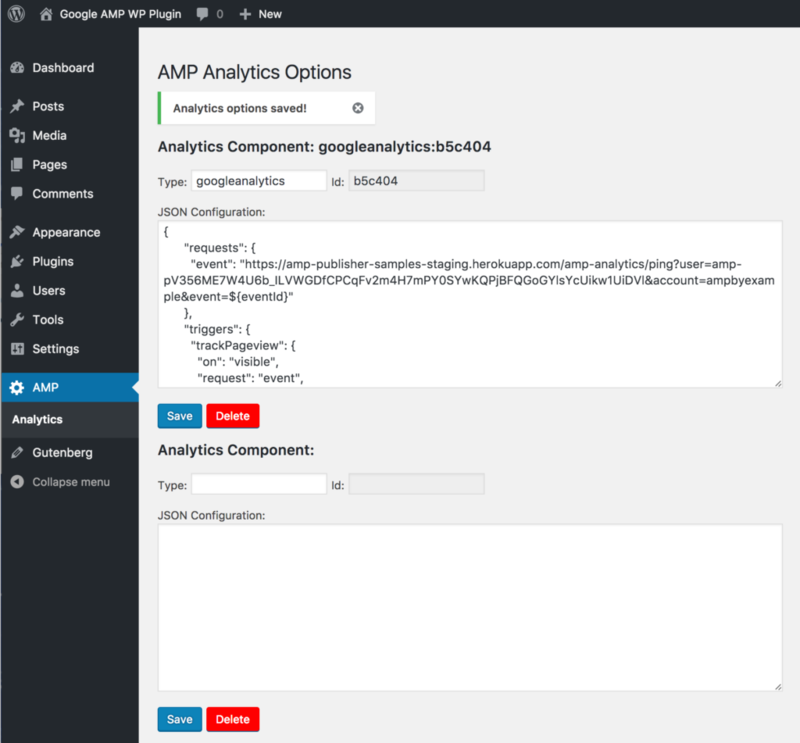 👉 For more on the JSON configuration supplied for Google Analytics, see Adding Analytics to your AMP pages. In ‘Classic’ template mode, you can use the section below if you’re using ‘Native’ or ‘Paired’ mode. type: (string) one of the valid vendors for amp-analytics. attributes: (array) any additional valid attributes to add to the ampanalytics element. 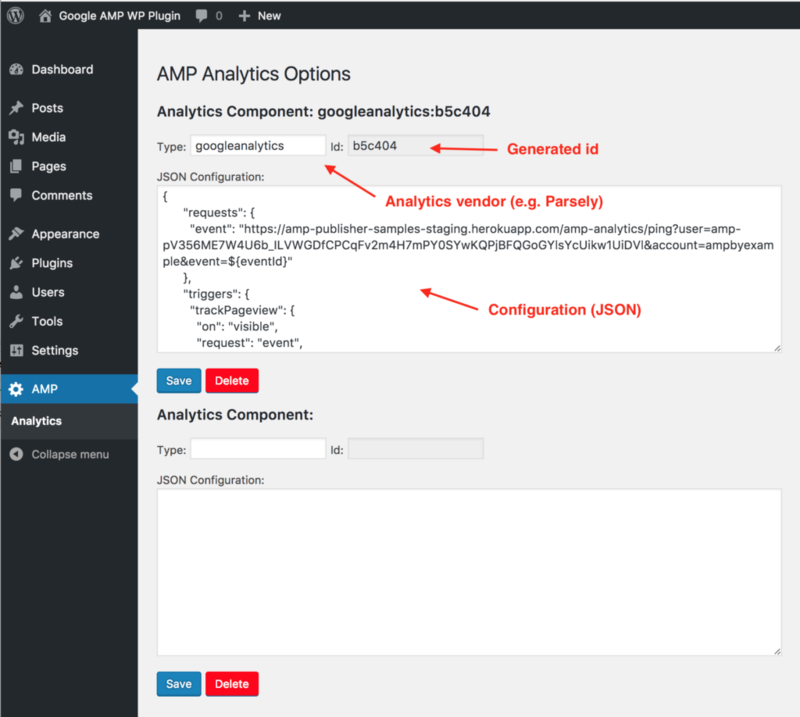 config_data: (array) the config data to include in the amp-analytics script tag. This is json_encode-d on output. When in ‘Native’ or ‘Paired’ mode, you can use the filter amp_analytics_entries, though this will also apply if there’s no theme support. If you are implementing analytics within a plugin, you may want to use this filter as well as the legacy amp_post_template_analytics in order to accomodate ‘Classic’ mode sites as well as ‘Native’ and ‘Paired’ sites. * Filters the analytics data for <amp-analytics> elements. *     An array of associative array(s) of the analytics entries to output. *     @type string $type   The analytics vendor, like 'googleanalytics' or 'nielsen'. *     @type string $config JSON-encoded data to be output inside the <amp-analytics> element's <script type="application/json">. // There could be another array() here, for another <amp-analytics> element.